Are there an conditions which are favorable to A.) large site population sizes, B.) larger armies, and C.) lots of wars between nations? I'm just having a feeling for some procedurally generated violence on a mass scale recently. It's a little hard to directly control war frequency, especially if you're only using advanced world parameters. Your best bet without modding would be to generate a small world with a lot of civilizations close together, but there's no guarantee that'll work. If you aren't adverse to raw modding, pumping how much civs value war would definitely lead to a direct increase in wg violence in general. Increasing world population in general could actually be helped by turning down savagery a bunch, since that value seems directly related to how populated sites end up being. I'm looking for a balanced world: Some cold parts, some hot parts, some evil some good, some calm, some savage. Default settings already produce balanced worlds, at least in geographic and climatic terms. For making minerals more frequent you just have to tweak the "mineral scarcity" option in advanced worldgen. I think that, by default, it's at 2500; lowering it to 1500-1000 should be more than enough. Yeah, default settings work well. Just choose 'everywhere' for minerals (or maybe 'frequent' if 'everywhere' gives too much metal). I'm looking for advice on changing the terrain closest to rivers. I want to bring the hilly terrain closer to the riverbank, or make the valleys that form around rivers less uniform. Here I have a few screenshots to help explain what I mean. Rivers and brooks erode the surrounding land in a uniform manner. Always present is the 3-tile corridor of even terrain. Even the smallest brook nestled in the highest mountains will create this size of valley. My issue is that I want more interesting terrain closer to the rivers and brooks. 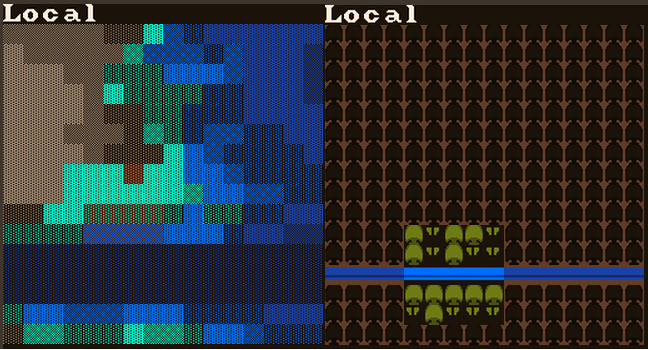 Is this river flatland out of our control in world generation? I played with the erosion settings without much luck. You can hack the mid level tiles immediately prior to embark with the Region Manipulator http://www.bay12forums.com/smf/index.php?topic=164136.msg7454345#msg7454345 DFHack script. Note that the changes are temporary, i.e. 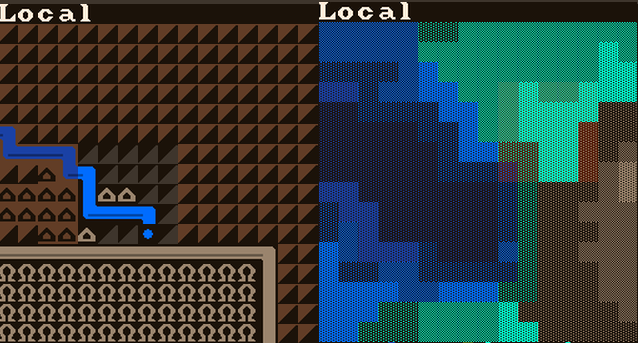 if you change to focus to a different world tile the original configuration is regenerated. If you embark while the focus is retained the embark retains your modifications. I don't know what happens with Adventure mode visits to such fortresses, though.